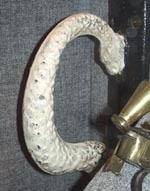 There is one exhibit above all others in the Signal Tower Museum in Arbroath (one-time home of the lightkeepers) which I have always pondered over - what's more even greatly admired -and that is an old cast-iron hand grip, . . . a relic from the early days of the Bell Rock. It was one of number which once adorned the outside of the old-style pre-1902 lantern. They were there to steady keepers when cleaning the outside glass or effecting any repairs required on the lantern. Although much painted over decades of use, the shape is unmistakeably that of a mythical sea serpent! 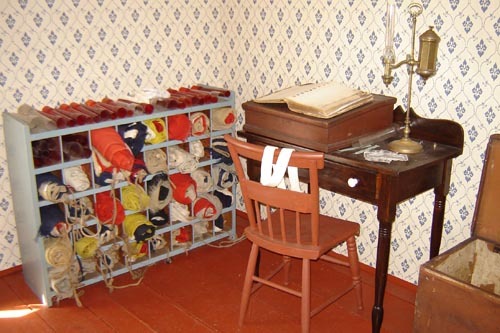 In Newfoundland, over 2000 miles away, work had begun in the early 1830s on their own lighthouse building programme. Cape Spear, leading light for St John's harbour, was one of the first, and is now their oldest surviving lighthouse. In consultation with the Commissioners of Northern Lights, they bought in 1836 the revolving mechanism from Inchkeith island lighthouse in the River Forth, off Edinburgh. In Scotland the age of replacing the older catoptric systems with the new Fresnel lenses had begun. Today the original Cape Spear lighthouse is little more than an empty shell, and nothing remains of the old Inchkeith mechanism. The old 1816 chandelier originally from the Isle of May - now to be seen in situ at the Cape Bonavista Lighthouse in Newfoundland, Canada. Courtesy of Cape Bonavista Lighthouse. 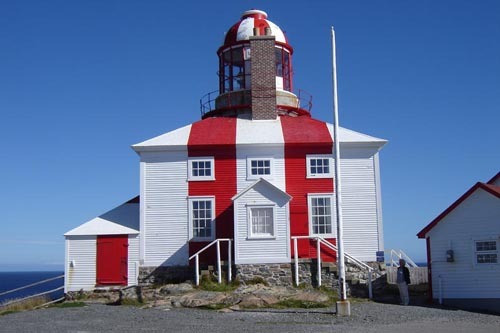 In 1843 the Bell's old revolving chandelier and Argand lamps of 1811 were sent out to Cape Bonavista on Robert Stevenson's advice, and continued there until 1895 when it was finally retired after 84 years' service. No one there seems to know the eventual fate of the Bell's old revolving chandelier . . . probably rusting in someone's backyard was one of the possible suggestions! Their "new" light, however, began its service at the Isle of May lighthouse in 1816. From there it went to Harbour Grace (1837), before finally coming to Cape Bonavista. It served there between 1895 to 1962, capping a remarkable 146 years' of operation, both in Scotland and Newfoundland. Today, although only a museum piece, it is the only light of its type on display in situ in eastern Canada. The lighthouse at Cape Bonavista, Newfoundland, Canada. 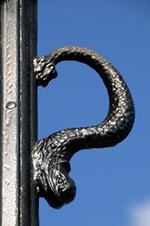 Note the serpent hand-grips clearly visible on the lantern astragals. When visiting Bonavista in 2007 and being shown round the tower by Don Johnson the curator, there much to my surprise was the same serpent-shaped hand-grip adorning the lantern astragals . . this one even more heavy painted than its Arbroath counterpart! In fact there were 16 of them (one on each vertical astragal) - a full complement no less. I don't think I ever heard tale of a lantern also going out with the light mechanism from Scotland. We do know that the Bell still had theirs in 1902 when it was replaced by the standard diagonal variety. So where did the one at Bonavista originate? There are a few possibility - but in all probability it must have come from Scotland - most likely from Stevenson's engineering works in Edinburgh. It obviously requires more research, so any comments would be appreciated. An interesing exhibit at Cape Bonavista . . . the signalling flags and red glass funnels for the Argand lamps. In 1846 Alan Stevenson developed his new style of lantern with diagonal instead of vertical framing and installed the first one at Noss Head. Made of gun metal, it is stronger, slimmer and less liable "to intercept light in any particular direction". It was adopted as the standard for the service, and this no doubt also sounded the death-knell for the heavier iron-wrought serpents. However, there are still a few of these pre-1846 lights still to be seen . . . Buchanness, Covesea Skerries and Cromarty and no doubt a few others. 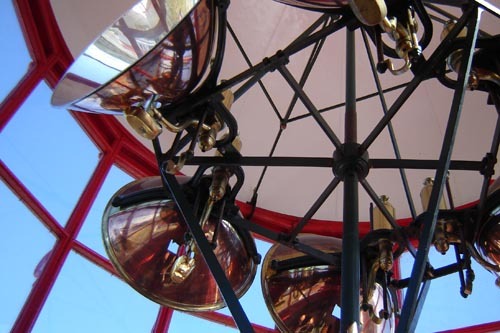 Between 1811 and 1846 24 lighthouses would have been topped with the self-same old-style lanterns - all with their full complement of serpent hand grips. The Bell's have long disappeared in major renovations of 1902 (except one which can still be seen in the shore Signal Tower). The Skerryvore serpents (left) can also be seen even after the devastating fire of 1954. Have a look now at one completely restored (left), to be seen Cromarty (who said a sea serpent is ugly!). Truly a work of art - graceful and beautifully wrought. Now coming up for 200 years old, it is a relic of the grand workmanship which was once lavished on these early Georgian / Victorian lighthouses. It is my favourite, and if anyone knows of a sea serpent that is looking for a good home, please let me know. I have a place for it! Last year (2009), the Bell Rock/Cape Bonavista connection was back in the news in Canada. 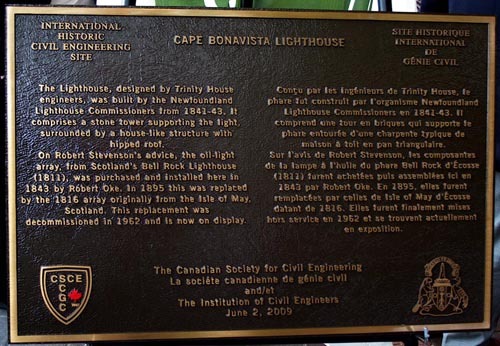 At the ASCE/CSCE/ICE Triennial Conference in St John's, Newfoundland, a new plaque was unveiled to commemorate Cape Bonavista Lighthouse as one of Canada's International Historic Civil Engineering Sites! This had come about as a result of a suggestion made by Prof. Roland Paxton, of Heriot Watt University, Edinburgh. Cape Bonavista with its Scottish Bell Rock connections had been accepted by all parties as a suitable site for this honour. It seems the Bell Rock and Cape Bonavista continue to remember aspects of their common ancestry!